I recently bought a Moleskine notebook because I’ve been meaning to try them out, and when I saw them on sale at Chapters, I decided to just get one. I originally wanted to get a Moleskine agenda, so I can finally keep my life in check… but then I realized what happens to all my notebooks/agendas. The end up somewhere I like to call Karen’s Graveyard for Notebooks. Seriously, sooner or later, they end up there. I guess I am what you would call a pack rat. I usually keep stuff for sentimental reasons such as old ticket stubs, pictures and random assortments of menus, maps, etc. that I have collected (maybe I will share them here with you one day?). Countless times, I have tried to start a diary/journal, but they always end up being left off at some random point of time in the past. I think my best record for a diary was around three years? And throughout those three years, there has been only around twelve entries. A lot of the times, I still bring my journal with me on trips but I never find time to write in them so I usually decide to fill it in when I return home. However, I find that it does not capture what I wanted it to and I often forget mentioning some important points that I would have wanted to remember. My Notebook Graveyard consists of not only different diaries that I have started, but an assortment of art notebooks, scrapbooks and ones where I just pasted inspirational things I found in magazines that I liked. The list goes on, and you would wonder how I still have the strength and energy to start so many new ones. But, what I’ve realized is that when I flip through them every now and then, it makes me happy to see that I at least took out some time to document certain parts of my life. I enjoy reading my diary and reminiscing back to fun times (and occasionally re-living sad times). It amuses me to see how I reacted or felt about events or things around me, and since time blurs old memories, my scrapbooks and notebooks sharpen them up again. So why all the different notebooks? 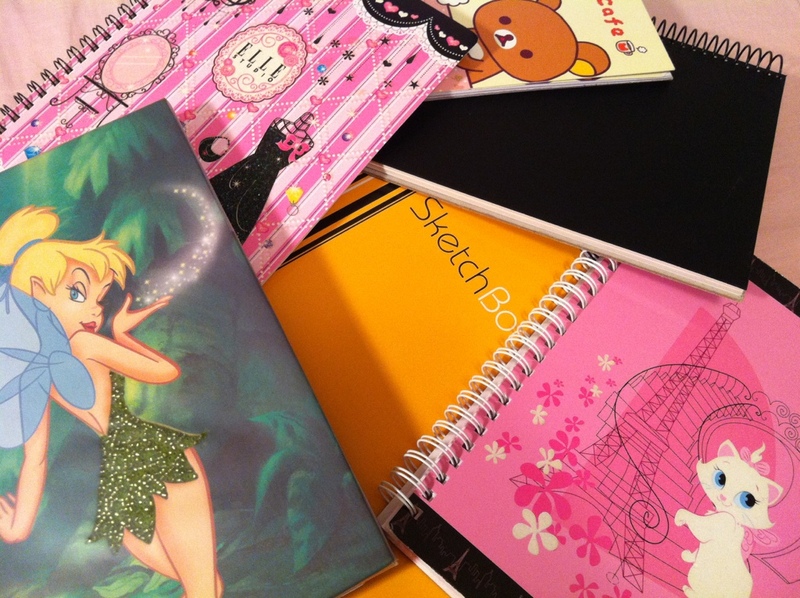 What usually happens is I fall in love with a notebook, and cannot wait to find some use for it. Then I get tired of it, or it loses its appeal and I move on. Or I get lazy and decide to stop writing in it for a while, but then as time passes, I feel hesitant to rekindle my relationship with that notebook. I end up starting a new notebook, with wild dreams and fierce determination that this will be the one that I will use forever. But I guess you can guess where the story ends. By now, I am pretty sure I will not be able to faithfully stick to one notebook. My Notebook Graveyard will continue to grow, but now worries, I pay them a visit every once in a while, and even drop off some extra words as my way of saying I still remember them. Plus, I will start new ones, so although it is going to be a pain having to read different ones to refer back to different times, it is a system that still works. I guess. When I first started this blog, I had the foresight to see where it may be heading. I think for now, my record has been okay. Although there’s only a few posts so far, I actually have had some more saved as drafts on my computer or on wordpress itself. It is just that I sometimes leave them off somewhere and have not finished them yet, but then I realize that they are no longer relevant. It is now winter, and I have written a very long blog post while on my summer roadtrip to California, which I felt was not appropriate to post. The same can be said for several other neglected posts! ahaha!!! Nice =D Not just me then ^^ And I can’t ever throw them away…so the pile just keeps growing..
i have that problem too.. lots of drafts that never make the cut. but thats part of the process!